Ise-Shima National Park on the the eastern coast of the Kii Peninsula is one of Japan’s foremost sightseeing areas, renowned for the scenic beauty of its myriad islands and deeply indented ria coastline, and for the deep spiritual and historical significance of the secluded Ise Jingū Grand Shrine and forest. In this land rich in natural resources and brimming with unique plants and animals, humanity has coexisted with nature for thousands of years. Sea cliffs near Nakiri, Shima City, carved out by millennia of coastal erosion and upheaval. Ise-Shima National Park occupies the Shima Peninsula and surrounding inland areas of central Mie Prefecture. The park, which was created in 1946 directly after the Second World War, comprises almost 600 square kilometres including marine areas, and encompasses the three cities of Toba, Ise and Shima, as well as the town of Minami-Ise. The remarkable scenery of the ria coastline was formed by upheavals in the Earth’s crust and changes in sea level, as valleys were filled by the ocean and hills were transformed into islands. Before they were inundated by the ocean, sheltered bays such as Ago Bay, Motoya Bay and Gokasho Bay were low-lying valleys by the sea. The coastline of Ago Bay is particularly complex, with deep indentations between fingers of land reaching out into the water. The more than sixty islands of various shapes and sizes appear to float, serene and beautiful, in the expansive setting of the bay. 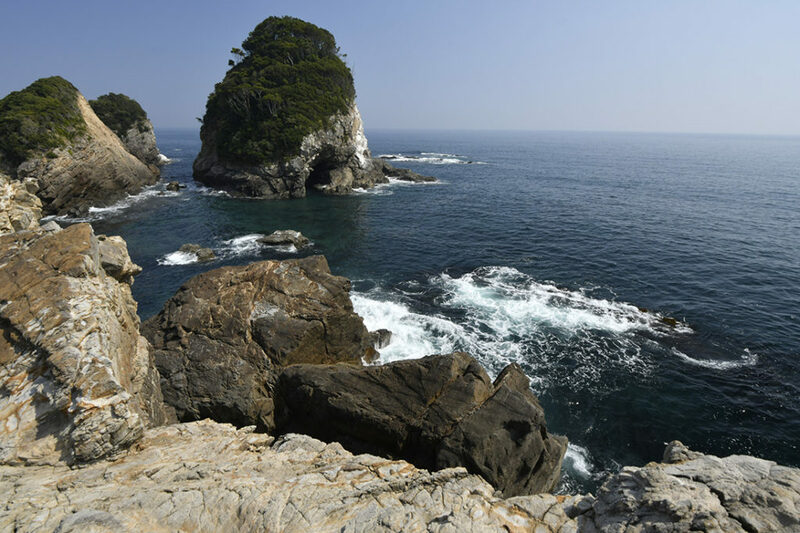 Facing the open sea and taking the full force of waves pounding in from the Pacific Ocean, coastal headlands such as Daiō-zaki, Goza-misaki and Shidonohana are characterised by rugged sea cliffs formed by the work of the waves. Around Saki-Shima Peninsula, a long, narrow piece of land at the southern end of the Shima Peninsula, coastal terraces have formed as the old abrasion platform has lifted above the surface of the sea. Sand-spits have formed all along the shoreline, creating ‘land-tied islands’ such as the headlands of Kujira-zaki, Anori-zaki and Daiō-zaki, which are connected to the mainland by low-lying sand bars. At Oukaura, flanking the entrance to Gokasho Bay, the Ōike lagoon was created when the mouth of the inlet was was blocked by a sandbar. Meanwhile, just off the coast of Toba City, the islands of Tōshi-jima and Kami-shima are actually the tops of foothills formerly connected to the Kii mountain range that now sit isolated out in Ise Bay. Panoramic views of the coastline can be had from Toba Tenbōdai lookout on the Pearl Road which runs roughly parallel to the coast. Another great vantage point the lookout at the top of Mt Asama, the highest point in the park. This is accessed via the Ise-Shima Skyline scenic route leading from Ise City into the mountains. 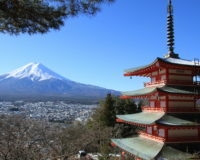 Both viewing points offer spectacular views of the sunrise in the east and on a clear winter’s day, views as far as Mt Fuji. The beautiful woodland surrounding the Naikū Inner Shrine. The Ise Jingū Grand Shrine complex lies at the heart of the inland section of the national park. 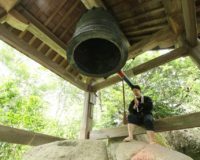 There are 125 shrines in the complex, including the two main shrines, the Naikū (Inner Sanctuary) and the Gekū (Outer Sanctuary), located about five kilometres apart. The Naikū and Gekū shrines are simply constructed in the ancient yuiitsu shinmei-tsukuri style. The long ridge pole of the kayabuki-yane thatched roof is supported by free-standing munamochi-bashira pillars at each end of the building. The main sanctuaries of the shrines are each enclosed by four layers of high fence. In accordance with the ancient tradition of Shikinen-sengū, these two shrine buildings are rebuilt every twenty years. 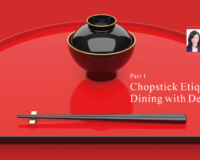 This tradition began in the late 7th century during the reign of Empress Jitō. Behind the Naikū lies the 5,500-hectare Kyūikirin (also called Jingū no Mori) forest belonging to the shrine. From this mountainous area flows the Isuzu River, a major waterway that spills into Ise Bay. In the past, the Kyūikirin shrine forest was designated as the forest from which timber for the shrine buildings would be harvested. However, due to a lack of suitable timber, a different forest was later designated. 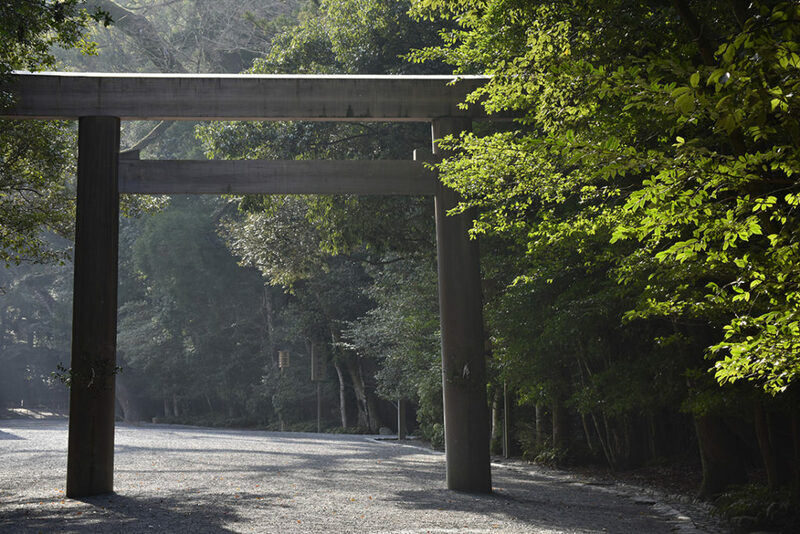 Nonetheless, the shin-no-mihashira post, the most sacred element around which the shrine building is constructed, continues to be harvested from the Kyūikirin forest. The main vegetation in this region is defined as temperate evergreen broadleaf forest. Camellias and beech trees grow here in large numbers, with climbing plants and vines such as Asiatic jasmine (Trachelospermum asiaticum) thriving in the gloomy interior of the forest. Remnant stands of subtropical broadleaf evergreens growing within the shrine forest hint at the type of forest that used to grow here. Chinese fringe flower (Loropetalum chinense) and deciduous azaleas (Rhododendron sanctum), grow wild here – one of very few places in Japan where they do so. The subtropical vegetation of the Izawanomiya forest and stands of hamanatsume (Paliurus ramosissimus), a designated natural monument of Mie Prefecture, suggest a connection with subtropical zones. The Onigajō (Demon’s Castle) Rocks and stands of Hosotani warm-climate ferns in the town of Minami-Ise are designated natural monuments of Japan. The relatively mild climate here contributes to a richly varied scenic landscape, with warm-climate plants able to grow year-round in the absence of extreme temperature differences. The sun sinks over Ago Bay in the southern Shima Peninsula. 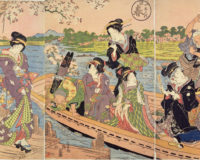 Images of ama, women divers, and floating pearl rafts are deeply connected with the coast of the Shima Peninsula. Using traditional methods with an emphasis on maintaining the ecological balance, the ama harvest seaweed and shellfish such as abalone and turban snails. 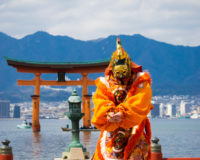 In 2017, “fishing techniques of ama women divers in Toba and Shima” was designated as a national important intangible folk cultural property. It was in 1907 that the art of developing perfectly round cultured pearls was mastered in the Shima Peninsula. 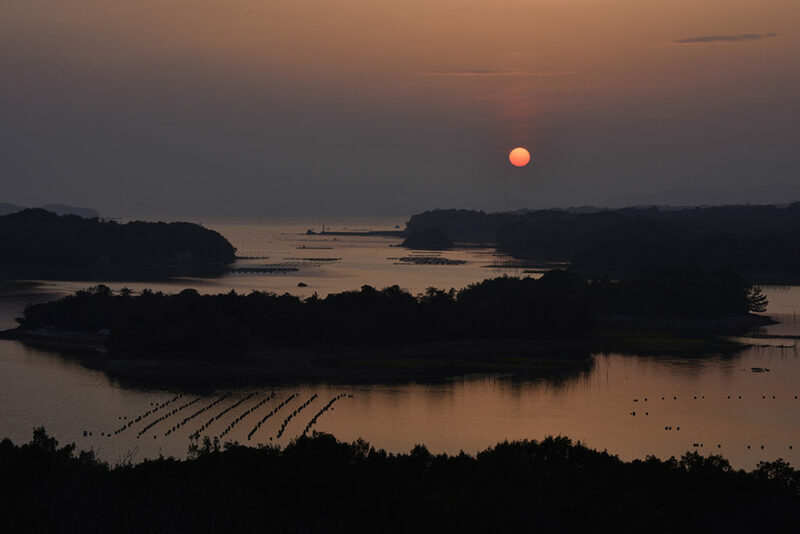 More than a century later, the pearl rafts floating in the sheltered bays of the southern part of the peninsula have blended in with the natural environment, becoming part of the iconic coastal scenery. 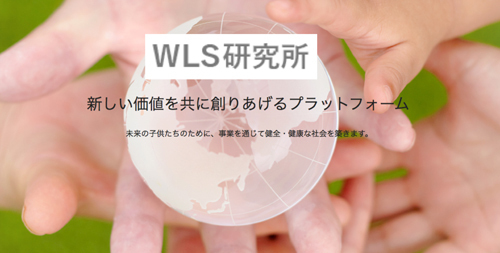 Today, cultured pearls from the Ise-Shima region continue to be sought after worldwide. A wide variety of flowering plants abound within the confines of the national park. The Japanese blue flag iris (Iris ensata), the prefectural flower of Mie Prefecture, grows here. Near the coast, the fragrant white flowers of grand crinum lilies (Crinum asiaticum) bloom in summer. Colonies of these bulb-forming evergreen perennials can be seen growing wild on Wagu-Ōshima Island, while wild colonies of “gold and silver chrysanthemums” (Ajania pacificum), native to the Kii Peninsula, thrive in the southern Shima Peninsula. Some flowering coastal plants, such as beach beans (Canavalia lineata) and creeping oxe-eye daisies (Sphagneticola trilobata) have been designated as prefectural natural monuments. Animal life abounds, both on land and in the water. The Kyūikirin shrine forest is home to deer, monkeys, tanuki and foxes, and several species of bats inhabit the caves. The national park provides habitat for many species of birds, too. The forests of Ise Jingū Grand Shrine and coastal areas such as Kamishima Island are perfect for bird-watching. Asian house martins, which usually make their nests in mountainous areas, have been confirmed as breeding around Mieshima and have been designated as a prefectural natural monument. The nekogigi catfish, a designated natural monument of Japan, and akame-dojo loach are important species inhabiting the Isuzu River. Reptiles such turtles can be seen in a number of places and the Japanese giant salamander inhabits the clear mountain streams. Marine animals include black finless porpoises, which are a common sight in spring and autumn where they can be seen in groups of various sizes chasing after schools of fish in the bays of Ise, Toba and Ago. On the east coast of the Shima City area, loggerhead turtles come ashore to lay their eggs between May and August. One unique aspect of Ise-Shima National Park is the large number of people living within the park boundaries and the high rate of privately-owned land compared to other national parks in Japan. As a result, a major feature of the park is the deep connection between the land and the lives, culture, history and customs of the people who live here. In fact, this coexistence of people in harmony with nature is a large part of the appeal of Ise-Shima National Park. 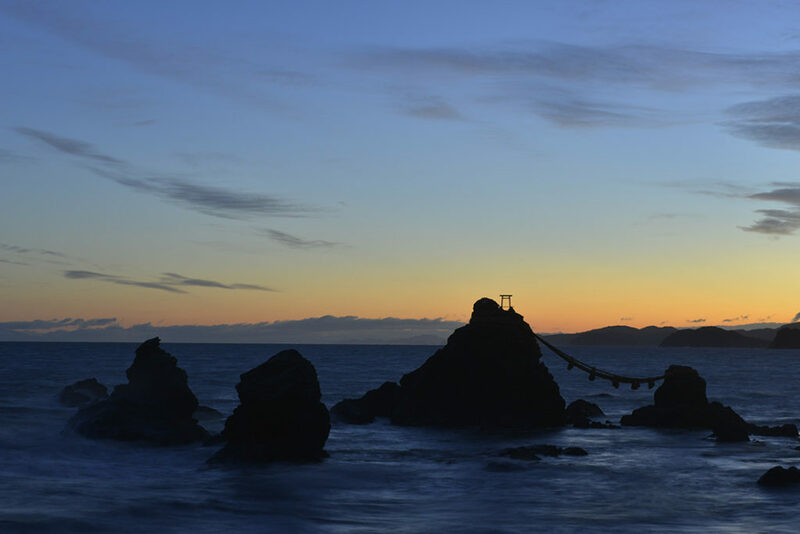 Futamichoe, Ise City: the Meoto Iwa (Married Couple Rocks) bound to each other by lengths of sturdy shimenawa sacred rope. The iconic image of the sun rising between the rocks can be captured from May through July.